Mychal Kendricks suffered a broken tibia and is out for the remainder of the season. Rookie safety Ronnie Harrison of the Jaguars will miss the remainder of the season due to a knee injury. The severity of the injury isn't yet known but if it's something along the lines of a torn ACL, he will may have to begin the 2019 season on the PUP list. Fantasy stud Eddie Jackson hurt his ankle last week and is likely to miss the remainder of the regular season but figures to be back for the playoffs. Bradley McDougald tweaked his knee again and spent the rest of the game on the sidelines. His status for Week 16 will be updated later this week. Kenny Vaccaro sustained a concussion and was ruled out of last week's game. He will have to pass through the proper protocols before seeing game action again. Sean Lee returned to the active roster but only saw 10 snaps in the game. That number figures to raise in the coming weeks, but it could very well end up being lower than most think (25-30% range). DT Vita Vea (TB) - Expectations were high for Vea, the 12th overall pick in this year's draft, coming into the season. However, an injury in training camp forced him to miss all of preseason and several regular season games. Not notching a fantasy point until Week 7 led to Vea being all but forgotten about in redraft leagues. He's finally healthy however and coming off his best game of the season in which he registered a sparkling 9 total tackles while playing 79% of the defensive snaps. 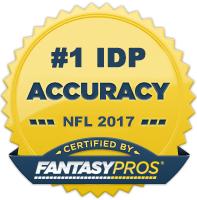 He plays the Cowboys this week who have given up the most points to opposing defensive tackles, making him a very sneaky DT2+/DL3- play. DE Sam Hubbard (CIN) - Hubbard has had a solid rookie season. He's coming off a two-sack performance last week, giving him five over his last seven games. He saw his playing time increase up to around 60% last week as well (after hovering around 40% in previous weeks). He's shaping up to be a nice late-season add in dynasty formats as well as a useful DL3-/DL4+ in redraft leagues for Week 16. LB Elijah Lee (SF) - The 49ers are opting to get a serious look at some of their younger players and started Lee over Malcolm Smith for the second week in a row. Lee responded with a productive day in the box scores, leading all 49ers linebackers with 10 total tackles (7 solo). Fred Warner has greatly slowed down as the year has progressed which leaves the door wide open for Lee to finish the year strong and help put up low-end LB3 numbers for fantasy teams. LB Lorenzo Alexander (BUF) - Alexander had spent the vast majority of his 10+ year career is relative obscurity until he emerged with a 12.5 sack season in 2016 at the age of 33. His production took a nose dive the following year, however. He's had a bit of a bounceback year in 2018 with 6.5 sacks in a part-time role. The season-ending injury to Matt Milano has made Alexander a full-time player now and he posted some of his best tackle production as a result (6 tackles). With the increased playing time, Alexander presents as a unique (widely available) high-upside option due to his tackle opportunity and sack ability. Consider him a boom/bust LB4+ in most balanced leagues. LB Austin Calitro (SEA) - With Mychal Kendricks on injured reserve with a broken leg, Calitro has been re-elevated into a near every-down role. He's been pretty productive on a per snap basis this season, so it's not surprising that a significant bump in playing time led to a big bump in production last week as he led the team in tackles with eight (six solo). Consider him a LB3- for the rest of the season. S Adrian Phillips (LAC) - Phillips has dabbled as a subpackage linebacker for the Chargers in recent years but he hasn't seen a significant enough role there to have sustained, reliable value. That's changed in the last couple of weeks though as he's seen his overall snap counts rise and he's been seeing most of his time at linebacker. That was especially true last week as he saw 100% of the snaps with essentially all of them coming at linebacker. This said, it's not a complete shock he led the team in tackles last Thursday night (10 total tackles). He goes against an extremely run-heavy Ravens team this week and is a very attractive Championship week option at safety. CB Rasul Douglas (PHI) - Injuries within the Eagles secondary have forced Douglas to assume a full-time role in recent weeks which has resulted in a massive boost in fantasy production for the second year player out of West Virginia. Over his last three games, he's posted stat lines of 6-1, 9-1 INT and 1 PD, and 11-3. He should continue to see plenty of opportunity this week against DeAndre Hopkins and the Texans. S Josh Jones (GB) - The Packers have been fairly decimated by injuries in their defensive backfield which has allowed Jones to come out of the proverbial doghouse and back into a near every-down role. He's had at least four solo tackles in six of his last seven contests as a result and is a high floor DB4+ option for those looking for safe points in Week 16. He's also someone who deserves dynasty consideration in most league sizes.